May Day Studio's Letterpress Wrapping Paper: Devastation can Inspire Beautiful Things — Gift Horse + Co. In 2011, hurricane Irene hit Vermont. 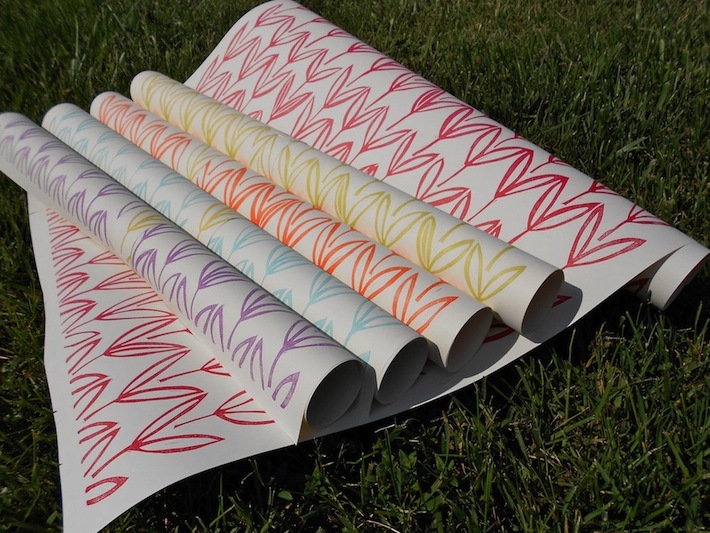 In response to the resulting devastation, Kelly McMahon of letterpress shop and bindery May Day Studio, in Montpelier, Vt., designed her fist-ever line of gift wrap. The post-hurricane landscapes — exposed rocky riverbeds and fields of flattened crops — inspired Kelly to create two patterns: "River" (above) and "Field" (below). Available in five colours each, the 18-by-24-inch sheets are individually letterpress printed from an original linocut, giving them a tactile variance in ink distribution that you won't find in mass produced papers. What makes the wrapping paper even more special though, is that 10 percent of proceeds to go to the Vermont Disaster Relief Fund, which two years later continues to assist with long-term recovery efforts. The gift wrap is $10 US per two sheets of a single colour/pattern, or $25 US per sampler package of five sheets (five colours of one pattern). For more on Kelly McMahon and May Day studio, visit the May Day Studio website. To purchase its wrapping paper, visit May Day Studio's Etsy shop or visit one of its retailers. And keep an eye out for a new wrapping paper design called "Cloud," which you can catch a sneak peek of on May Day Studio's home page.